Spring is here and it’s time to celebrate all things green! Herbs, lettuces, and green alliums are all to be celebrated for the next few months and Green Goddess salad is the perfect way to enjoy all of those things. Green Goddess Dressing is Caesar’s herby cousin that makes even salad-phobes LOVE salad. Creamy, herby, and slightly umami, Green Goddess makes your spring lettuces satisfying and far from austere. This recipe makes quite a bit of dressing, so if you’re not feeding a crowd, make a batch for the week and use as needed. Blend all ingredients in blender until uniform and smooth, about 1 minute. Store in an airtight container for up to one week. Toss salad ingredients with as much dressing as you’d like and serve immediately. Keep any unused dressing in an airtight container and store for up to one week. Summer is NOT over! Make these Herbed Zucchini Cakes while zucchini is still dirt cheap at the market and your neighbors are still drowning in zucchini from their backyards. These really don’t take long to make and are great as an appetizer for guests or as a light main course. I use almond flour to bind the patties, as it lends body and more flavor than breadcrumbs or flour do. It also happens to make this dish paleo and gluten-free :). Just make sure to wring the zucchini out well so that when making the patties they’ll come together without having to add extra almond flour. Don’t make these unless you plan on having some kind of sauce! Tangy sheep’s milk yogurt and lime, along with fresh mint, is the best way to do these puppies justice. If you’re vegan or dairy free (or not…), they’re also great with Creamy Vegan Red Pepper and Tomato Summer Sauce. Place grated zucchini and potato in a colander and toss with salt. Let drain in sink or large bowl while you prepare the remaining ingredients and dipping sauce. In a large bowl, mix together egg, parsley, thyme, mint, lime zest and black pepper. Wring out zucchini with clean dish towel- the drier you get it, the less almond flour you will need! 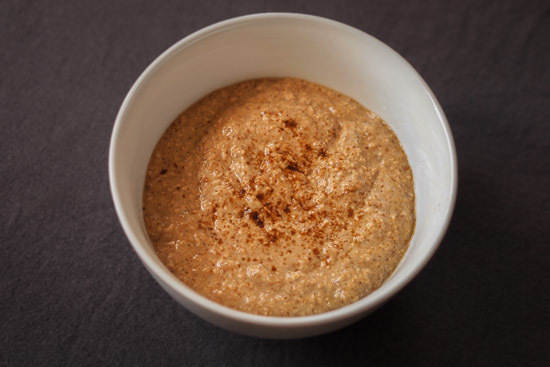 Add wrung zucchini and almond flour to bowl with other ingredients and combine. Form into patties (this is where you’ll realize whether or not you need more almond flour). Heat a large pan with avocado oil over medium-high heat. Form patties with zucchini mixture and sear on pan, 2-3 minutes each side. Serve with Minted Sheep’s Milk Yogurt Dipping Sauce or Creamy Vegan Roasted Red Pepper Summer Sauce. Stir yogurt, lime juice and mint together in a small bowl. I was blessed with these gorgeous zucchini blossoms, thanks to my mom’s contractor, who happens to have three acres in upstate Connecticut and, apparently, plenty of zucchini plants. Just because winter is coming doesn’t mean beautiful produce ends. I usually like to toss squash blossoms into saffron risotto at the end of cooking. However, with such a big bag of blossoms I felt I had enough that I could do some experimenting. I knew I wanted to try stuffing them, but usually that includes a breadcrumb filling followed by deep frying. I wanted to make them gluten free and definitely not fried, as I prefer to avoid heating oils to such high levels. This combo seems to straddle summer and fall, with herbs like basil, mint and thyme, heavily sprinkled into a mixture of goat cheese, lemon and sweet potato. This is a beta-carotene-filled snack, thanks to the orange petals and the sweet potatoes. Also, the fresh herbs have highly concentrated amounts of phytochemicals, which ward off viruses and other more serious ailments. In particular, mint is known to calm digestion, which especially important for those who struggle with IBS. Also, basil is an especially powerful anti-inflammatory, which is key for those who suffer from arthritis or other joint pain. In addition, the oils in thyme are shown to be highly antimicrobial, which means consuming more thyme helps fight bad bacteria so you don’t get sick as easily. Sounds better than that multivitamin, no? 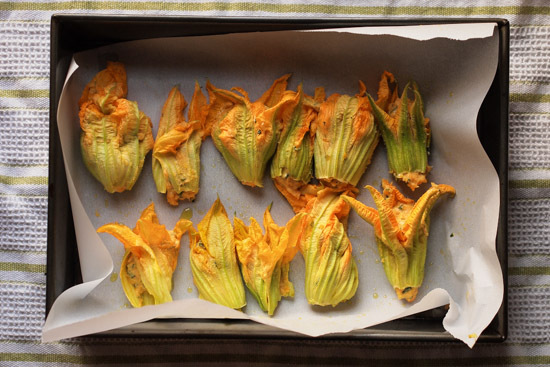 You definitely want to serve these nutritional tasties immediately while hot, as they lose their texture a bit as they sit and the petals lose their crisp. I think they’re great alone, but you could serve with a mildly flavored dipping sauce as an appetizer or top a salad or risotto with them. Toss sweet potato chunks with oil and arrange on parchment-lined baking sheet. While sweet potatoes roast, mix together goat cheese, thyme leaves, mint, basil, lemon zest and lemon juice in a medium bowl. When sweet potatoes are crisp-tender (about 20 minutes), put in bowl with goat cheese mixture and mash together with a fork. Taste for lemon, salt and pepper. Adjust as needed and add eggs. Mix well. Line the same baking sheet with a fresh sheet of parchment and lightly grease with oil. Using a small spoon, scoop the goat cheese-sweet potato mixture into blossoms (it’s okay if they split, just wrap the petals around the stuffing) and arrange on prepared baking sheet. Drizzle with oil and bake for about 20 minutes, until they’re beginning to brown and crisp. They will also be nice and puffy :). Sprinkle with thinly sliced mint and serve alone or with a dipping sauce. I like my Creamy Vegan Red Pepper and Tomato Summer Sauce ;). This is a pretty simple salad but I thought I’d share it anyway. You can easily play with this by adding things like walnuts, goat cheese or olives. I’ve kept it clean by leaving out oil, but feel free to add some. The picture is of Version 1, but I thought I’d include the recipe for Version 2 as I did it a while ago and really enjoyed it. Trim green beans and blanch in boiling salted water for about 3 minutes. Strain and let cool. While green beans are cooling, put tomatoes in medium-sized bowl and add the acid ingredients (Version 1: balsamic; Version 2: lemon juice and red wine vinegar) and oil, if using. Once beans are cooled, add to bowl along with endives and basil for Version 1 or goat cheese and dill for Version 2. Season salt and pepper and toss to coat. You can either serve immediately or let marinate for a few hours.